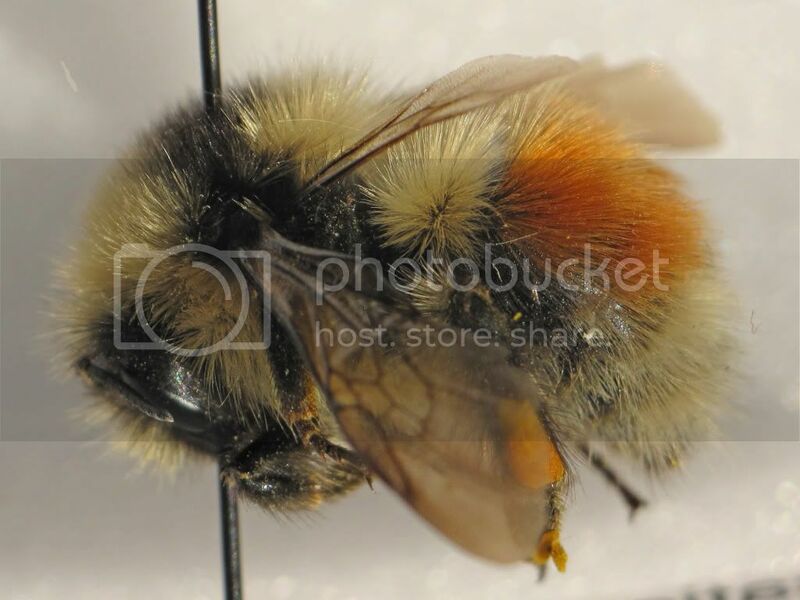 That is one of the hairiest bees I’ve ever seen. The mimic is almost perfect. Great pose on the Shiny. Looks like it’s still walking. Doesn’t look anything like the specimens I was allowed to access from the student drawer at school. Too many legs and other delicate parts. 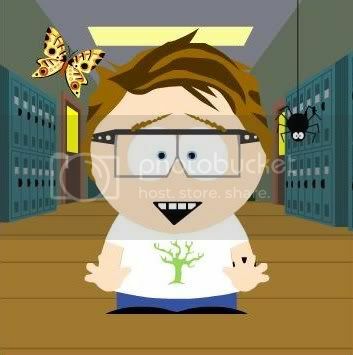 Yeah, the fly made me awfully nervous about getting it from my net to my vial…I was worried it would sting me…and then I was SURE it was a fly…but then I wasn’t…so I continued to be careful until after it had a swim in ethanol. Interesting…it also protruded a long, pointy, dark “stinger” out the rear…and made thrusting motions as if to sting. An extremely convincing display! 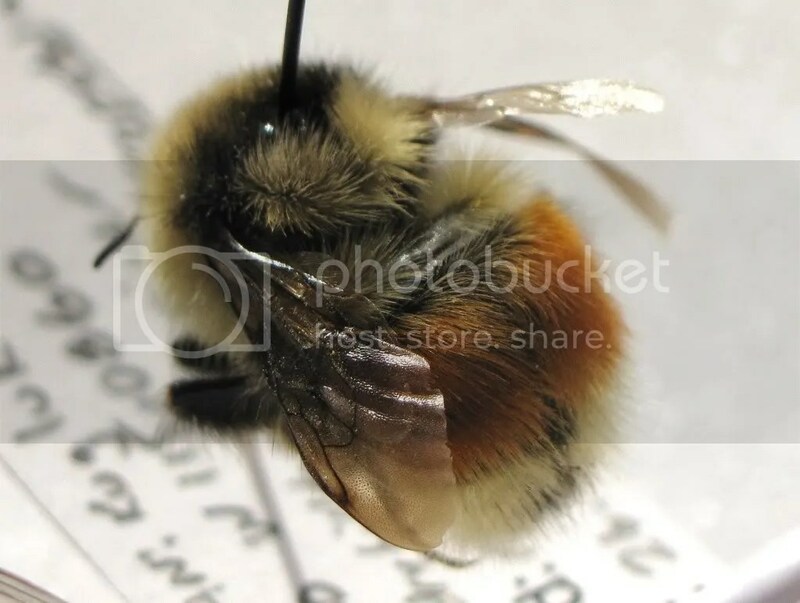 Also, the face looks bee-like…just the shape and overall fuzziness was not like any fly I’d ever seen. Until I had counted the wings (2) and spotted the calypters, I remained uncertain as to its identity. 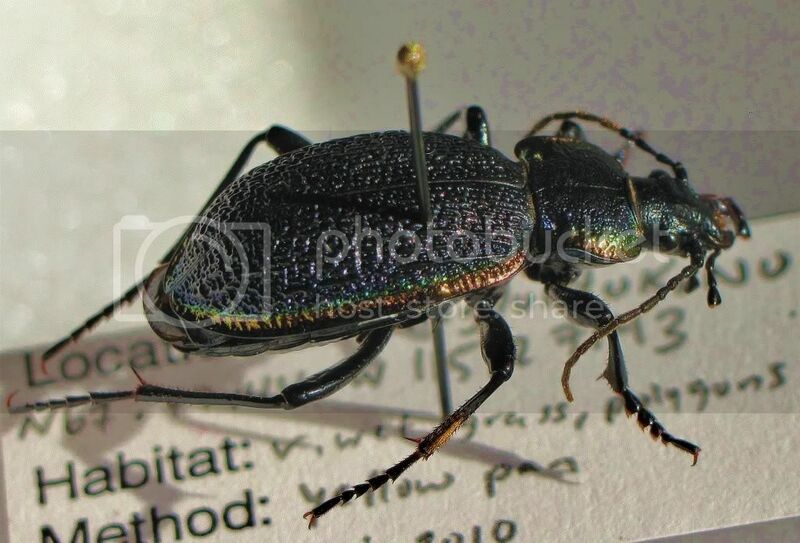 I want that carabid so much. So, very, very much. Also, that bee mimic is great. I think it’s by far the best carabid I have caught. In ever. Is that a robber fly? Must be! 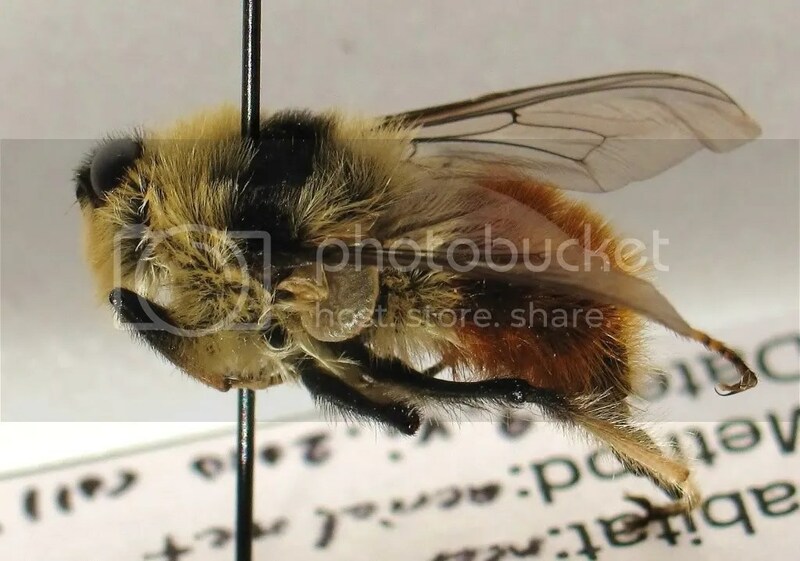 I can’t imagine what else could be such an awesome bumblebee mimic. It is teh awesome. I promise to keep looking for tigers, though…as for the fly…I think Morgan’s got some interesting ideas! WOW! Shiny beetle, blah blah blah, but holy smokes that’s a wicked fly! I was with Ted thinking that it was a Robber Fly when I first saw it, but now I’m fairly certain it’s actually much, much cooler! I’m pretty sure it’s actually a Bot fly (Oestridae)! Those calypters appear to be way to big for an asilid, and it seems to be missing a generally vital piece of morphology, the mouth! Very very cool fly. Definitely some incredible mimicry going on there, although if it is a bot fly, then it won’t be hanging out at flowers with the bees to feed (adults don’t need to eat, and couldn’t if they wanted to considering the lack of a mouth) so perhaps it has something to do with it’s host selection and staying hidden until an unknowing host comes along! Awesome find, and if that’s what you pull in on your first week, then I can’t wait to see what else you come across this summer! Seriously though, SWEET! This is great information! I don’t have a microscope in my apartment but I’m going to the high school to use their science room tomorrow, and they’ve got some dissecting scopes…I’ll have a look at the mouthparts (or lack thereof) then (I tried just now to peek but all I see is fuzz…there’s definitely nothing obvious there, though.) I didn’t think of bot flies…but now I’m looking through some of my field guides, and I think you’ve got it. I seem to recall Ken saying it was hovering over the plants, dipping down, then hovering again. Would that be something bots would do? Nilssen, A.C., Anderson, J.R., Bergersen, R. 2000. 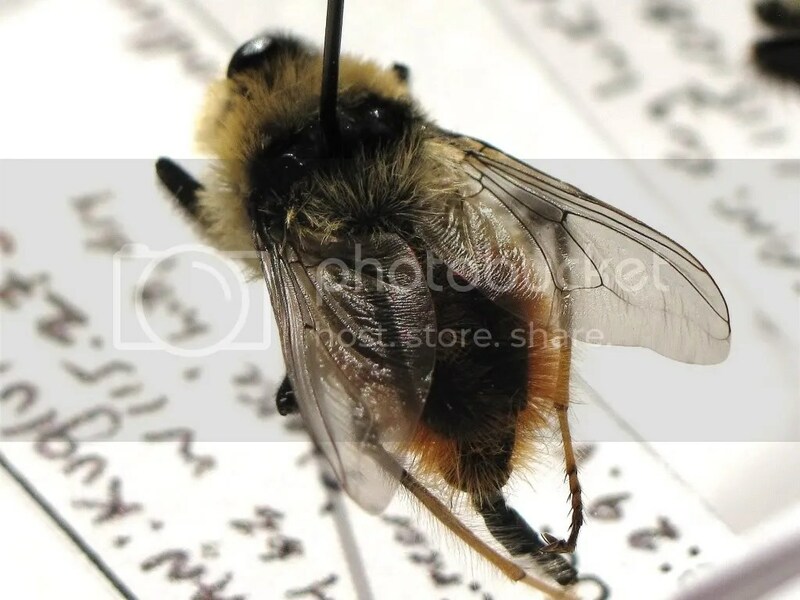 The Reindeer Oestrids Hypoderma tarandi and Cephenemyia trompe (Diptera: Oestridae): Batesian Mimics of Bumblebees (Hymenoptera: Apidae: Bombus spp.)? Journal of Insect Behaviour 13 (3): 307-320. Next I expect images of caribou and then oestrids on caribou! Like I said, awesome find!